We are proud to announce our new rewards programs for our frequent buyers. We want you to continue to use Black Mamba as your primary source for you knife purchases. To reward your loyalty, we will roll out this program to reward you and that you can use at your discretion by going on our web site pick your product and checkout with your personal Coupon code. How simple can it get? We want you and your future business. For this purpose, We have designed a loyalty program to give you our buyers a built- in discount based on your tier. Our web site will always have prices on our product but your personal Coupon code will change your price based on your tier in the checkout section. We will monitor your tier and update your status as you make more purchases. Yes, your discount is for life and only you know how much you are saving. Your card with code will arrive to your home and you can start using it immediately. As one of our tier buyers we will also give you access to our limited iconic knives we will be making. You will have first opportunity to purchase these limited editions before they go public. Yes, your discounts will work on these also. Damascus Level Card: This is our top level. To attain this you will have made 20 Black Mamba purchases. Platinum level Card: 12 % discount. 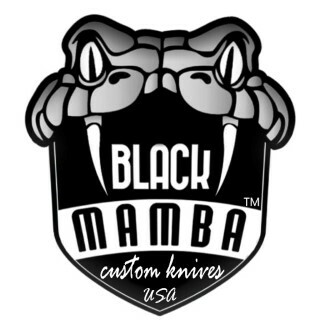 To qualify you will have purchased 12 Black Mamba Knives. You will receive a special Physical card with coupon code that you can use on all future purchases to receive your 12% discount. GOLD LEVEL Card: 10 % discount. To qualify you will have purchased 9 Black Mamba Knives. You will receive a special Physical card with coupon code that you can use on all future purchases to receive your 10% discount. SILVER LEVEL Card : 7 % Discount. To qualify you will have purchased 6 Black Mamba Knives. You will receive a special Physical card with coupon code that you can use on all future purchases to receive your 7% discount. BRONZE LEVEL Card: 5% Discount. To qualify you will have purchased 3 Black Mamba Knives. You will receive a special Physical card with coupon code that you can use on all future purchases to receive your 5% discount. The more you purchase the more you save. !! If you can attain out Damascus Level Black Mamba Knives will send you an engraved Damascus card with our logo, your name engraved and a complimentary gift of your own Custom knife designed by you up to a $300.00 value. If you want a knife exceeding the $300.00 value you will only pay the difference above $300.00.